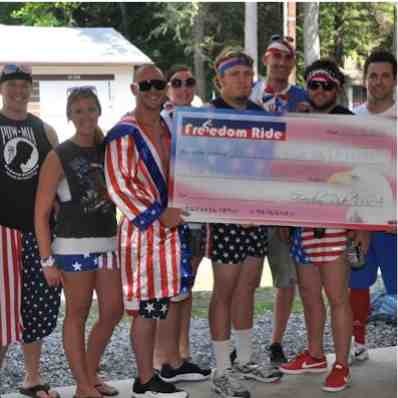 Register for Freedom Ride 2019! We ask for a donation of $20 for adults and $10 for children. Children 12 and under are required to wear a helmet, thanks for your cooperation. 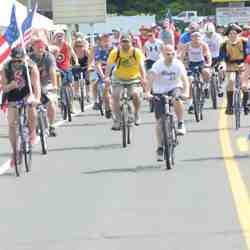 Please review the PA BIKE LAWS before participating in Freedom Ride 2017. If you are not able to attend the ride you can still support by clicking the button below. Any amount is greatly appreciated! To register, sponsor or donate by check contact us for details. Featured, Diamond, Platinum & Gold sponsors must donate before June 1st to ensure business name/ logo is printed on the official Freedom Ride T-shirt. In 6 years as a charity we have been able to raise $138,000! Thanks to all of the riders who have donated and our generous sponsors. 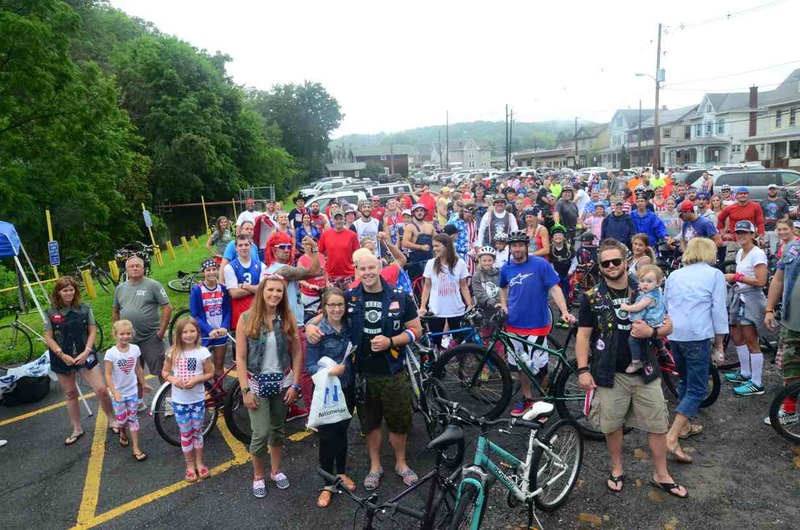 Freedom Ride is a patriotic bike ride on the 4th of July that raises money and donates 100% of the profit to the James E. Van Zandt Medical Center in Altoona, PA. In five years we have been able to raise over $100,000 for veterans! 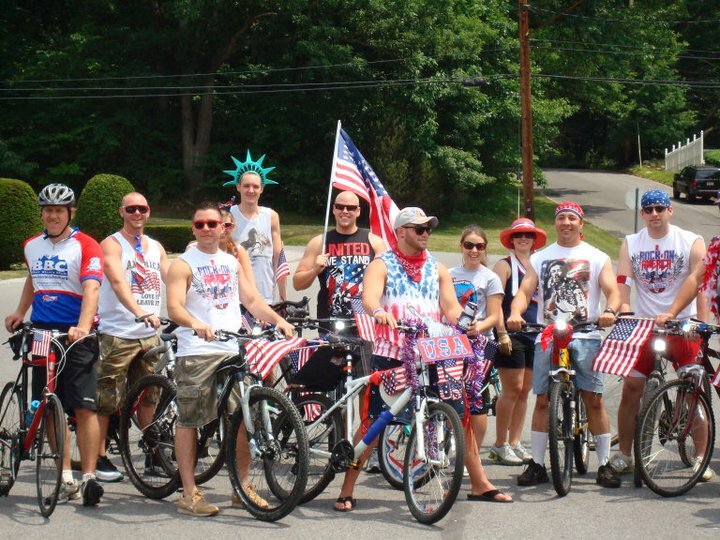 To celebrate our freedom by coming together to ride free and proudly showing support for our great country and the men and women who have served to protect our freedom. We have been able to help verterans at the James Van Zandt Medical Center by being involved in annual projects. 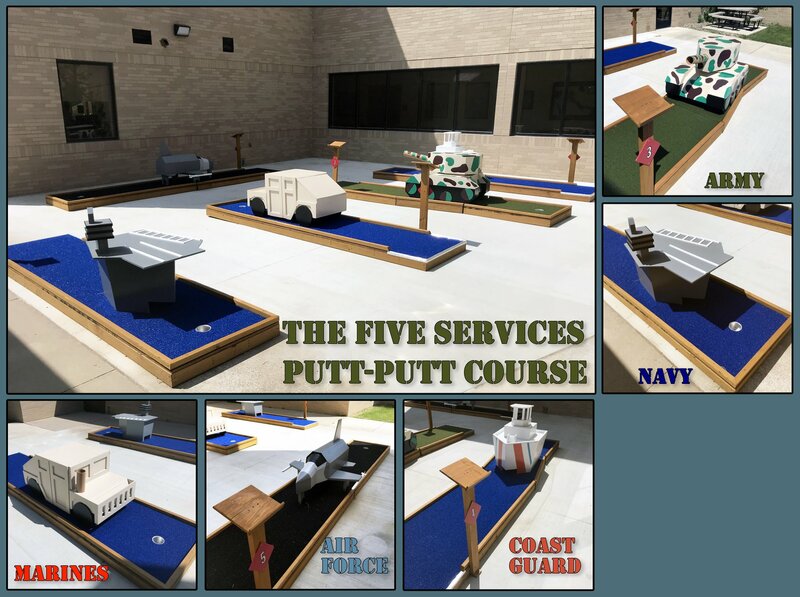 Projects include: raising money for funds to benefits veterans and their families; renovating the bus used to take residents to events; building a miniture golf course for residents, outpatients and visitors; updating the bingo system used by residents; purchasing indoor versions of bowling, bocce ball and hore shoes; rennovating several outdoor areas that can be used by residents, outpatients and visitors. 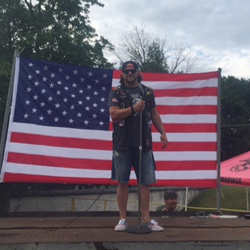 The ride starts and ends at the American Legion (1459 Lincoln Ave)in Tyrone, PA. The distance is approximately 10 miles. 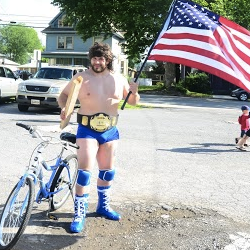 Brought together by the common thread of growing up in Central PA a group of friends decorated their bikes and dressed in their best USA gear and rode from Tyrone to Tipton on July 4th. The Freedom Ride board of directors is formed and the vets staying at the James E. Van Zandt VA Medical Center are chosen to be the benefactors of Freedom Ride. 100 people met at Reservior Park in Tyrone to ride to Tipton and back. Following the ride a great picnic was held and awards were given out. 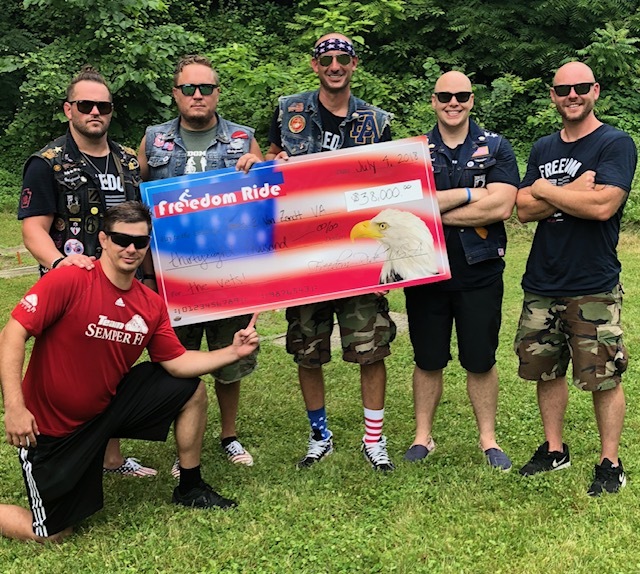 16 local business sponsored the event helping to raise $4,000 for the three veterans fund at the VA.
150 riders and 40 sponsors helped to raise $7,000. 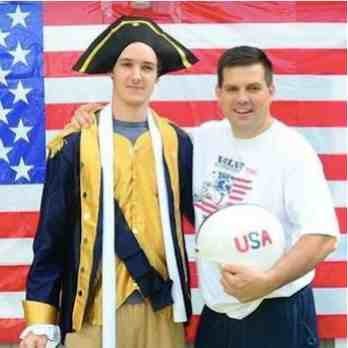 local legend Jay Paterno took part and caught Freedom Ride fever and has taken part each year since. 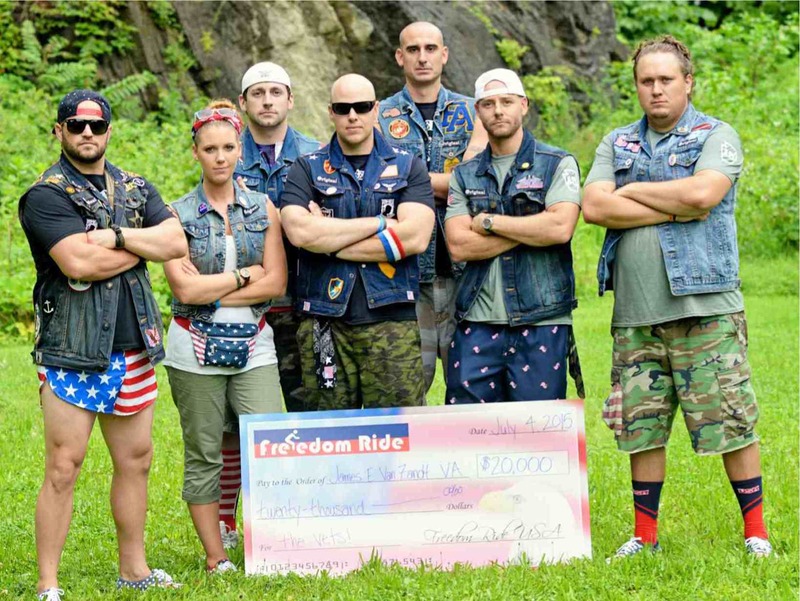 Freedom Ride grew too big for its location. 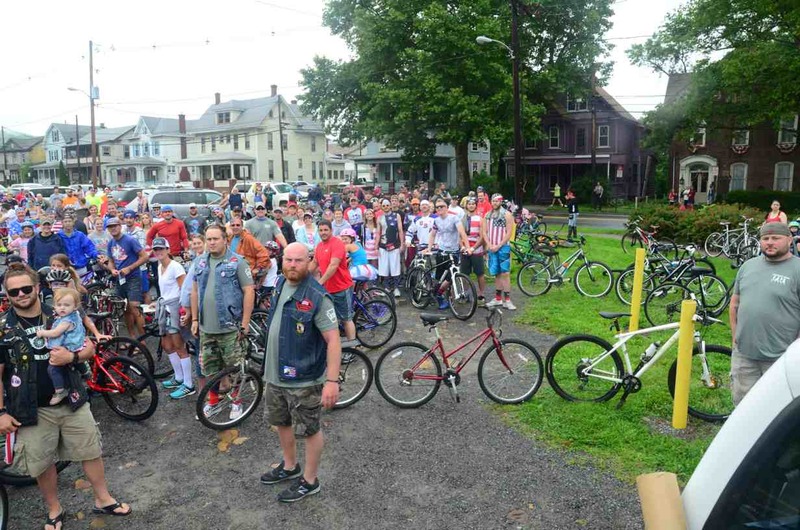 The Tyrone American Legion became the host for the ride and 2015 was a huge success. We were able to raise $12,000 for the vets at the VA! Despite the rain more than 200 people came out to ride. 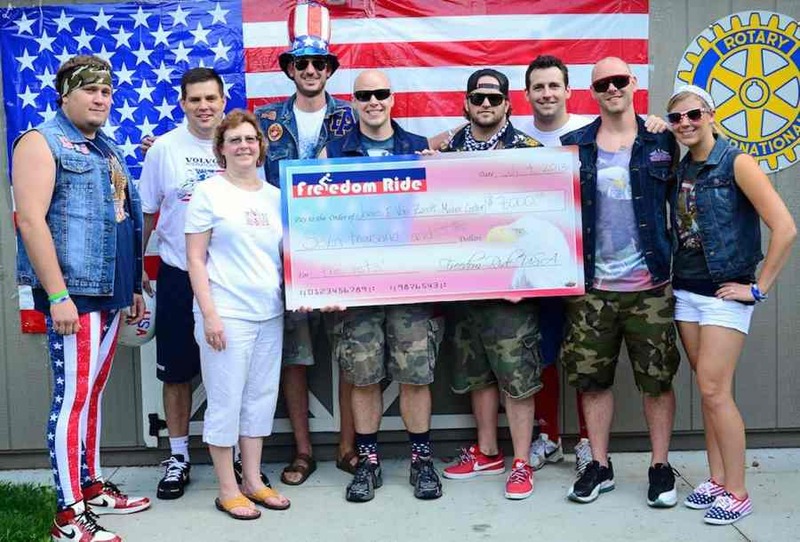 We were able to raise $20,000 to donate to the VA which was used to renovate a bus used to take the vets on day trips. Over 350 riders came out to take part in the biggest and best ride to date. We were able to raise $25,000! 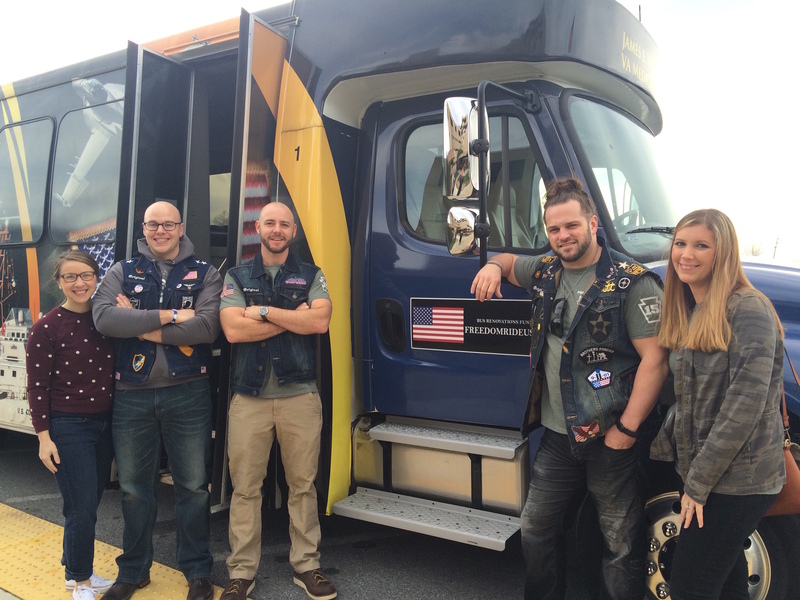 The guys from the VA came down to visit and led the ride on the renovated bus! 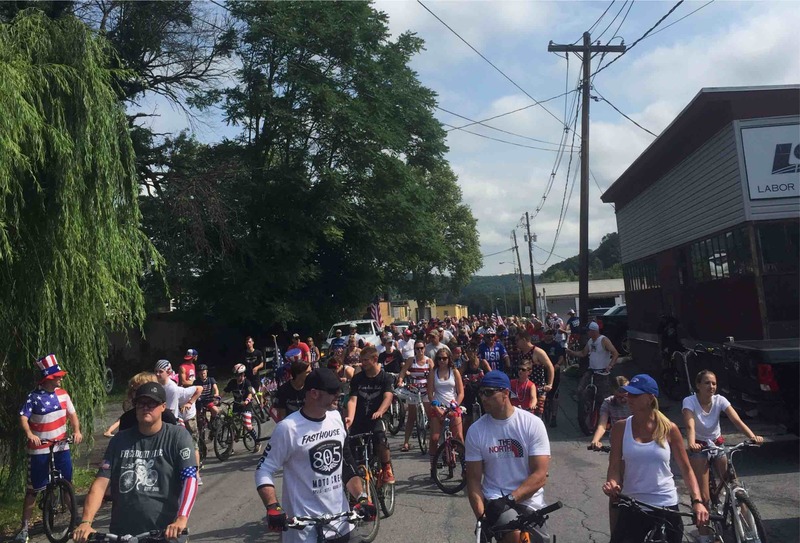 Over 400 people came out to ride and help raise $32,000. The guys came down from the VA came celebrated the 4th with us and The Bicycle Shop joined in to help prep bikes for the ride. Our 6 year total as a charity hit the $100,000 mark! 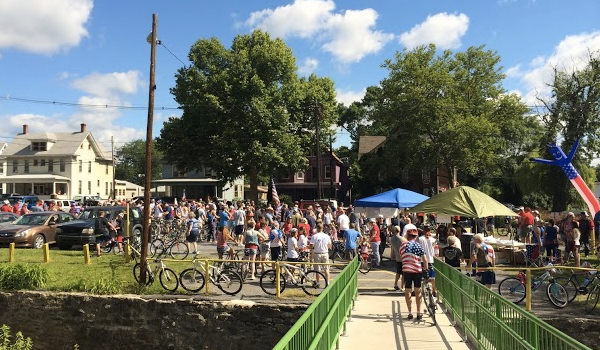 450+ rider can out despite the blistering heat and helped us raise $38,000. Send us a message and we will repond as soon as possible. 2011 was the year Freedom Ride began. 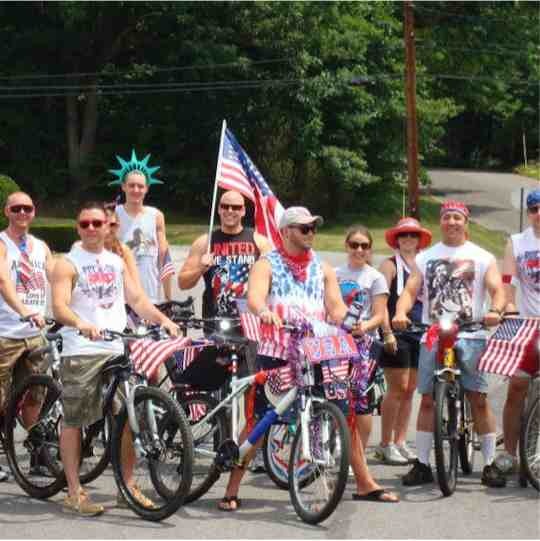 It started as a few friends getting together to ride bikes when we were all home for the 4th of July. Soon other friends wanted to join in, then before we knew it we had more than twenty people ready to ride free. 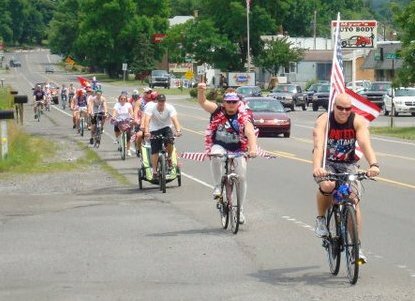 While we were riding people asked us what we were riding for, our response was for our country and to support our veterans. 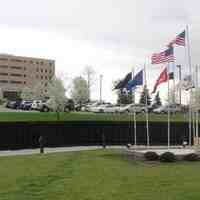 That is when we decided in 2012 we were going to raise money to benefit the vets staying at the local veterans hospital. 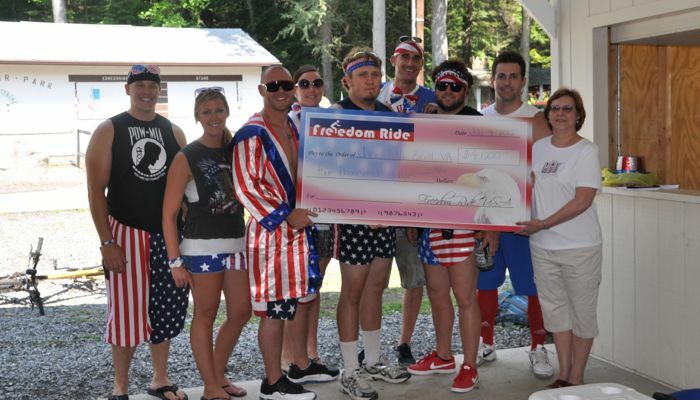 Freedom Ride 2012 was a huge success! 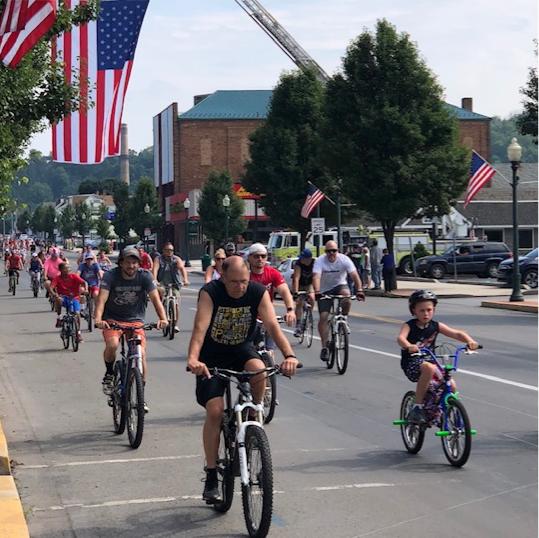 A big thank you goes out to all the freedom riders, everyone who came out to show support along the ride route, everyone who made personal donations and all the business sponsors who helped make the ride happen. We were able to raise over $4,000 to benefit the veterans at the James E. Van Zandt Medical Center! 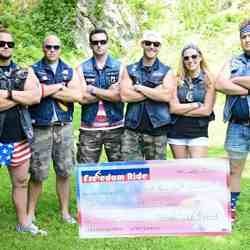 Freedom Ride gets bigger and better! 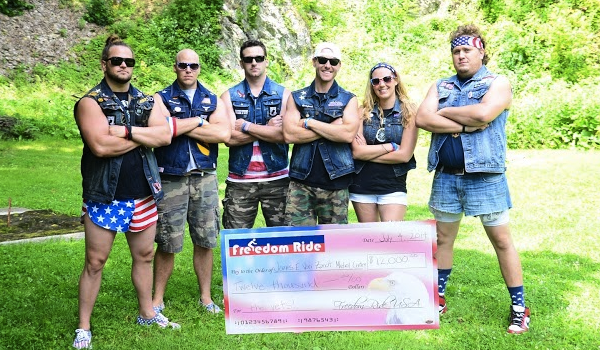 Freedom Ride 2014 raised $12,000 to benefit the veterans at the James E. Van Zandt Medical Center! Thanks to everyone who rode, helped out and came to show support! Freedom Ride 2016 raised $25,000 to benefit the veterans at the James E. Van Zandt Medical Center! Thanks to everyone who rode, helped out and came to show support! 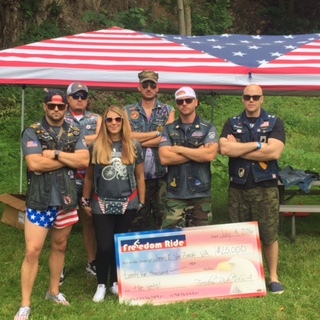 Freedom Ride 2017 raised $32,000 to benefit the veterans at the James E. Van Zandt Medical Center! Thanks to everyone who rode, helped out and came to show support! LHuge thanks to everyone who came out in the rain to ride free and help us raise $20,000!